The law or principle of comparative advantage holds that under free trade, an agent will produce more of and consume less of a good for which they have a comparative advantage. Comparative advantage is the economic reality describing the work gains from trade for individuals, firms, or nations, which arise from differences in their factor endowments or technological progress. In an economic model, agents have a comparative advantage over others in producing a particular good if they can produce that good at a lower relative opportunity cost or autarky price, i.e. at a lower relative marginal cost prior to trade. One shouldn't compare the monetary costs of production or even the resource costs (labor needed per unit of output) of production. Instead, one must compare the opportunity costs of producing goods across countries. 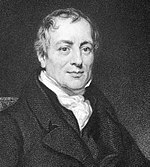 David Ricardo developed the classical theory of comparative advantage in 1817 to explain why countries engage in international trade even when one country's workers are more efficient at producing every single good than workers in other countries. He demonstrated that if two countries capable of producing two commodities engage in the free market, then each country will increase its overall consumption by exporting the good for which it has a comparative advantage while importing the other good, provided that there exist differences in labor productivity between both countries. Widely regarded as one of the most powerful yet counter-intuitive insights in economics, Ricardo's theory implies that comparative advantage rather than absolute advantage is responsible for much of international trade. If a foreign country can supply us with a commodity cheaper than we ourselves can make it, better buy it off them with some part of the produce of our own industry employed in a way in which we have some advantage. The general industry of the country, being always in proportion to the capital which employs it, will not thereby be diminished [...] but only left to find out the way in which it can be employed with the greatest advantage. [I]f I wish to know the extent of the advantage, which arises to England, from her giving France a hundred pounds of broadcloth, in exchange for a hundred pounds of lace, I take the quantity of lace which she has acquired by this transaction, and compare it with the quantity which she might, at the same expense of labour and capital, have acquired by manufacturing it at home. The lace that remains, beyond what the labour and capital employed on the cloth, might have fabricated at home, is the amount of the advantage which England derives from the exchange. In 1817, David Ricardo published what has since become known as the theory of comparative advantage in his book On the Principles of Political Economy and Taxation. In case I (diamonds), each country spends 3600 hours to produce a mixture of cloth and wine. In case II (squares), each country specializes in its comparative advantage, resulting in greater total output. In a famous example, Ricardo considers a world economy consisting of two countries, Portugal and England, which produce two goods of identical quality. In Portugal, the a priori more efficient country, it is possible to produce wine and cloth with less labor than it would take to produce the same quantities in England. However, the relative costs of producing those two goods differ between the countries. In this illustration, England could commit 100 hours of labor to produce one unit of cloth, or produce 5/6 units of wine. Meanwhile, in comparison, Portugal could commit 90 hours of labor to produce one unit of cloth, or produce 9/8 units of wine. So, Portugal possesses an absolute advantage in producing cloth due to fewer labor hours, and England has a comparative advantage due to lower opportunity cost. In the absence of trade, England requires 220 hours of work to both produce and consume one unit each of cloth and wine while Portugal requires 170 hours of work to produce and consume the same quantities. England is more efficient at producing cloth than wine, and Portugal is more efficient at producing wine than cloth. So, if each country specializes in the good for which it has a comparative advantage, then the global production of both goods increases, for England can spend 220 labor hours to produce 2.2 units of cloth while Portugal can spend 170 hours to produce 2.125 units of wine. 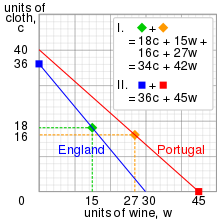 Moreover, if both countries specialize in the above manner and England trades a unit of its cloth for 5/6 to 9/8 units of Portugal's wine, then both countries can consume at least a unit each of cloth and wine, with 0 to 0.2 units of cloth and 0 to 0.125 units of wine remaining in each respective country to be consumed or exported. Consequently, both England and Portugal can consume more wine and cloth under free trade than in autarky. The Ricardian model is a general equilibrium mathematical model of international trade. Although the idea of the Ricardian model was first presented in the Essay on Profits (a single-commodity version) and then in the Principles (a multi-commodity version) by David Ricardo, the first mathematical Ricardian model was published by William Whewell in 1833. The earliest test of the Ricardian model was performed by G.D.A MacDougall, which was published in Economic Journal of 1951 and 1952. In the Ricardian model, trade patterns depend on productivity differences. The following is a typical modern interpretation of the classical Ricardian model. In the interest of simplicity, it uses notation and definitions, such as opportunity cost, unavailable to Ricardo. is the amount of labor needed to produce a unit of wine in Foreign. are drawn for illustrative purposes. We assume that the relative demand curve reflects substitution effects and is decreasing with respect to relative price. The behavior of the relative supply curve, however, warrants closer study. Recalling our original assumption that Home has a comparative advantage in cloth, we consider five possibilities for the relative quantity supplied at a given price. in the cloth sector. However, Home workers are indifferent between working in either sector. As a result, the quantity supplied can take any value. , then both Home and Foreign specialize in wine, for similar reasons as above, and so the quantity supplied is zero. of the world production of cloth to the world production of wine. , then both Home and Foreign specialize in cloth. The quantity supplied tends to infinity as the quantity of wine supplied approaches zero. , then Home specializes in cloth while Foreign workers are indifferent between sectors. Again, the relative quantity supplied can take any value. The blue triangle depicts Home's original production (and consumption) possibilities. By trading, Home can also consume bundles in the pink triangle despite facing the same productions possibility frontier. A symmetric argument holds for Foreign. Therefore, by trading and specializing in a good for which it has a comparative advantage, each country can expand its consumption possibilities. Consumers can choose from bundles of wine and cloth that they could not have produced themselves in closed economies. In 1930 Gottfried Haberler detached the doctrine of comparative advantage from Ricardo’s labor theory of value and provided a modern opportunity-cost formulation. Haberler’s reformulation of comparative advantage revolutionized the theory of international trade and laid the conceptual groundwork of modern trade theories. Haberler’s innovation was to reformulate the theory of comparative advantage such that the value of good X is measured in terms of the forgone units of production of good Y rather than the labor units necessary to produce good X, as in the Ricardian formulation. Haberler implemented this opportunity-cost formulation of comparative advantage by introducing the concept of a production possibility curve into international trade theory. Since 1817, economists have attempted to generalize the Ricardian model and derive the principle of comparative advantage in broader settings, most notably in the neoclassical specific factors Ricardo-Viner and factor proportions Heckscher–Ohlin models. Subsequent developments in the new trade theory, motivated in part by the empirical shortcomings of the H–O model and its inability to explain intra-industry trade, have provided an explanation for aspects of trade that are not accounted for by comparative advantage. Nonetheless, economists like Alan Deardorff, Avinash Dixit, Gottfried Haberler, and Victor D. Norman have responded with weaker generalizations of the principle of comparative advantage, in which countries will only tend to export goods for which they have a comparative advantage. In both the Ricardian and H–O models, the comparative advantage theory is formulated for a 2 countries/2 commodities case. It can be extended to a 2 countries/many commodities case, or a many countries/2 commodities case. Adding commodities in order to have a smooth continuum of goods is the major insight of the seminal paper by Dornbusch, Fisher, and Samuelson. In fact, inserting an increasing number of goods into the chain of comparative advantage makes the gaps between the ratios of the labor requirements negligible, in which case the three types of equilibria around any good in the original model collapse to the same outcome. It notably allows for transportation costs to be incorporated, although the framework remains restricted to two countries. But in the case with many countries (more than 3 countries) and many commodities (more than 3 commodities), the notion of comparative advantage requires a substantially more complex formulation. Skeptics of comparative advantage have underlined that its theoretical implications hardly hold when applied to individual commodities or pairs of commodities in a world of multiple commodities. Deardorff argues that the insights of comparative advantage remain valid if the theory is restated in terms of averages across all commodities. His models provide multiple insights on the correlations between vectors of trade and vectors with relative-autarky-price measures of comparative advantage. What has become to be known as the "Deardorff's general law of comparative advantage" is a model incorporating multiple goods, and which takes into account tariffs, transportation costs, and other obstacles to trade. Recently, Y. Shiozawa succeeded in constructing a theory of international value in the tradition of Ricardo's cost-of-production theory of value. This was based on a wide range of assumptions: Many countries; Many commodities; Several production techniques for a product in a country; Input trade (intermediate goods are freely traded); Durable capital goods with constant efficiency during a predetermined lifetime; No transportation cost (extendable to positive cost cases). In a famous comment McKenzie pointed that "A moment's consideration will convince one that Lancashire would be unlikely to produce cotton cloth if the cotton had to be grown in England." However, McKenzie and later researchers could not produce a general theory which includes traded input goods because of the mathematical difficulty. As John Chipman points it, McKenzie found that "introduction of trade in intermediate product necessitates a fundamental alteration in classical analysis." Durable capital goods such as machines and installations are inputs to the productions in the same title as part and ingredients. In view of the new theory, no physical criterion exists. The competitive patterns are determined by the traders trials to find cheapest products in a world. The search of cheapest product is achieved by world optimal procurement. Thus the new theory explains how the global supply chains are formed. Comparative advantage is a theory about the benefits that specialization and trade would bring, rather than a strict prediction about actual behavior. (In practice, governments restrict international trade for a variety of reasons; under Ulysses S. Grant, the US postponed opening up to free trade until its industries were up to strength, following the example set earlier by Britain.) Nonetheless there is a large amount of empirical work testing the predictions of comparative advantage. The empirical works usually involve testing predictions of a particular model. For example, the Ricardian model predicts that technological differences in countries result in differences in labor productivity. The differences in labor productivity in turn determine the comparative advantages across different countries. Testing the Ricardian model for instance involves looking at the relationship between relative labor productivity and international trade patterns. A country that is relatively efficient in producing shoes tends to export shoes. Assessing the validity of comparative advantage on a global scale with the examples of contemporary economies is analytically challenging because of the multiple factors driving globalization: indeed, investment, migration, and technological change play a role in addition to trade. Even if we could isolate the workings of open trade from other processes, establishing its causal impact also remains complicated: it would require a comparison with a counterfactual world without open trade. Considering the durability of different aspects of globalization, it is hard to assess the sole impact of open trade on a particular economy. Daniel Bernhofen and John Brown have attempted to address this issue, by using a natural experiment of a sudden transition to open trade in a market economy. They focus on the case of Japan.. The Japanese economy indeed developed over several centuries under autarky and a quasi-isolation from international trade but was, by the mid-19th century, a sophisticated market economy with a population of 30 million. Under Western military pressure, Japan opened its economy to foreign trade through a series of unequal treaties. In 1859, the treaties limited tariffs to 5% and opened trade to Westerners. Considering that the transition from autarky, or self-sufficiency, to open trade was brutal, few changes to the fundamentals of the economy occurred in the first 20 years of trade. The general law of comparative advantage theorizes that an economy should, on average, export goods with low self-sufficiency prices and import goods with high self-sufficiency prices. Bernhofen and Brown found that by 1869, the price of Japan's main export, silk and derivatives, saw a 100% increase in real terms, while the prices of numerous imported goods declined of 30-75%. In the next decade, the ratio of imports to gross domestic product reached 4%. Another important way of demonstrating the validity of comparative advantage has consisted in 'structural estimation' approaches. These approaches have built on the Ricardian formulation of two goods for two countries and subsequent models with many goods or many countries. The aim has been to reach a formulation accounting for both multiple goods and multiple countries, in order to reflect real-world conditions more accurately. Jonathan Eaton and Samuel Kortum underlined that a convincing model needed to incorporate the idea of a 'continuum of goods' developed by Dornbusch et al. for both goods and countries. They were able to do so by allowing for an arbitrary (integer) number i of countries, and dealing exclusively with unit labor requirements for each good (one for each point on the unit interval) in each country (of which there are i). Two of the first tests of comparative advantage were by MacDougall (1951, 1952). A prediction of a two-country Ricardian comparative advantage model is that countries will export goods where output per worker (i.e. productivity) is higher. That is, we expect a positive relationship between output per worker and number of exports. MacDougall tested this relationship with data from the US and UK, and did indeed find a positive relationship. The statistical test of this positive relationship was replicated with new data by Stern (1962) and Balassa (1963). Dosi et al. (1988) conduct a book-length empirical examination that suggests that international trade in manufactured goods is largely driven by differences in national technological competencies. One critique of the textbook model of comparative advantage is that there are only two goods. The results of the model are robust to this assumption. Dornbusch et al. (1977) generalized the theory to allow for such a large number of goods as to form a smooth continuum. Based in part on these generalizations of the model, Davis (1995) provides a more recent view of the Ricardian approach to explain trade between countries with similar resources. More recently, Golub and Hsieh (2000) presents modern statistical analysis of the relationship between relative productivity and trade patterns, which finds reasonably strong correlations, and Nunn (2007) finds that countries that have greater enforcement of contracts specialize in goods that require relationship-specific investments. Taking a broader perspective, there has been work about the benefits of international trade. Zimring & Etkes (2014) finds that the Blockade of the Gaza Strip, which substantially restricted the availability of imports to Gaza, saw labor productivity fall by 20% in three years. Markusen et al. (1994) reports the effects of moving away from autarky to free trade during the Meiji Restoration, with the result that national income increased by up to 65% in 15 years. Much has been written since Ricardo as commerce has evolved and cross-border trade has become more complicated. Today trade policy tends to focus more on "competitive advantage" as opposed to "comparative advantage". One of the most in-depth research undertakings on "competitive advantage" was conducted in the 1980s as part of the Reagan administration's Project Socrates to establish the foundation for a technology-based competitive strategy development system that could be used for guiding international trade policy. Several arguments have been advanced against using comparative advantage as a justification for advocating free trade, and they have gained an audience among economists. For example, James Brander and Barbara Spencer demonstrated how, in a strategic setting where a few firms compete for the world market, export subsidies and import restrictions can keep foreign firms from competing with national firms, increasing welfare in the country implementing these so-called strategic trade policies. Economist James K. Galbraith disputes these claims of the benefit of comparative advantage. He states that "free trade has attained the status of a god" and that " ... none of the world's most successful trading regions, including Japan, Korea, Taiwan, and now mainland China, reached their current status by adopting neoliberal trading rules." He argues that " ... comparative advantage is based upon the concept of constant returns: the idea that you can double or triple the output of any good simply by doubling or tripling the inputs. But this is not generally the case. For manufactured products, increasing returns, learning, and technical change are the rule, not the exception; the cost of production falls with experience. With increasing returns, the lowest cost will be incurred by the country that starts earliest and moves fastest on any particular line. Potential competitors have to protect their own industries if they wish them to survive long enough to achieve competitive scale." Galbraith then explains that nations trapped into specializing in agriculture are condemned to perpetual poverty. Agriculture is dependent on a finite natural resource called land. People can't make more of it. As the population increases the per capita land resources decreases. Also the average farm size has also been increasing. If a nation is not allowed to expand into manufacturing and only specialize in agriculture, that nation is condemned to an ever expanding poverty. Galbraith summarizes: "Comparative advantage has very little practical use for trade strategy. Diversification, not specialization, is the main path out of underdevelopment, and effective diversification requires a strategic approach to trade policy. It cannot mean walling off the outside world, but it is also a goal not easily pursued under a dogmatic commitment to free trade." [T]he fancied or real insecurity of capital, when not under the immediate control of its owner, together with the natural disinclination which every man has to quit the country of his birth and connexions, and intrust himself with all his habits fixed, to a strange government and new laws. For example, when workers cannot move from one industry to another - usually because they do not have the right skills or do not live in the right place - changes in the economy's comparative advantage will not shift them to a more appropriate industry, but rather to unemployment or precarious and unproductive jobs. A crucial assumption in both the classical and neoclassical formulation of comparative advantage theory is that trade is balanced, which means that the value of imports is equal to the value of each country's exports. The volume of trade may change, but international trade will always be balanced at least after a certain adjustment period. The balance of trade is essential for theory because the resulting adjustment mechanism is responsible for transforming the comparative advantages of production costs into absolute price advantages. And this is necessary because it is the absolute price differences that determine the international flow of goods. Since consumers buy a good from the one who sells it cheapest, comparative advantages in terms of production costs must be transformed into absolute price advantages. In the case of floating exchange rates, it is the exchange rate adjustment mechanism that is responsible for this transformation of comparative advantages into absolute price advantages. In the case of fixed exchange rates, neoclassical theory suggests that trade is balanced by changes in wage rates . In practice, however, the world is characterised by unemployment. Unemployment and underemployment of capital and labour are not short-term phenomena, but are common and widespread. Unemployment and untapped resources are more the rule than the exception. ^ Dixit, Avinash; Norman, Victor (1980). Theory of International Trade: A Dual, General Equilibrium Approach. Cambridge: Cambridge University Press. p. 2. ^ Maneschi, Andrea (1998). Comparative Advantage in International Trade: A Historical Perspective. Cheltenham: Elgar. p. 1. ^ "The Theory of Comparative Advantage: Overview". Flat World Knowledge. Retrieved 23 February 2015. ^ O'Sullivan, Arthur; Sheffrin, Steven M. (2003) [January 2002]. Economics: Principles in Action. The Wall Street Journal: Classroom Edition (2nd ed.). Upper Saddle River, New Jersey: Pearson Prentice Hall: Addison Wesley Longman. p. 444. ISBN 978-0-13-063085-8. ^ Steven M Suranovic (2010). "International Trade Theory and Policy". ^ Krugman, Paul (1996). "Ricardo's Difficult Idea". Retrieved 2014-08-09. ^ Smith, Adam (1776). An Inquiry into the Nature and Causes of the Wealth of Nations. ^ Torrens, Lionel (1808). The Economists Refuted and Other Early Economic Writings (1984 ed.). New York: Kelley. p. 37. ^ Wood, John Cunningham (1991). David Ricardo: Critical Assessments. Taylor & Francis. p. 312. ISBN 9780415063807. ^ Ingham, Barbara (2004). International Economics: A European Focus. Pearson Education. p. 22. ISBN 9780273655077. ^ Krugman, Paul; Obstfeld, Maurice (1988). International Economics: Theory and Policy (2008 ed.). New York: Prentice Hall. pp. 27–36. ^ "AP Economics Review: Comparative Advantage, Absolute Advantage, and Terms of Trade". www.reviewecon.com/comparative-advantage.html. 2016-09-28. ^ Bernhofen, Daniel (2005). "Gottfried haberler's 1930 reformulation of comparative advantage in retrospect". Review of International Economics. 13 (5): 997–1000. doi:10.1111/j.1467-9396.2005.00550.x. ^ Maneschi, Andrea (1998). Comparative Advantage in International Trade: A Historical Perspective. Cheltenham: Elgar. pp. 6–13. ^ Deardorff, Alan (Oct 1980). "The General Validity of the Law of Comparative Advantage". Journal of Political Economy. 88 (5): 941–57. doi:10.1086/260915. ^ Dixit, Avinash; Norman, Victor (1980). Theory of International Trade: A Dual, General Equilibrium Approach. Cambridge: Cambridge University Press. pp. 93–126. ^ Dornbusch, R.; Fischer, S.; Samuelson, P. A. (1977). "Comparative Advantage, Trade, and Payments in a Ricardian Model with a Continuum of Goods". American Economic Review. 67 (5): 823–39. JSTOR 1828066. ^ Dornbusch, R.; Fischer, S.; Samuelson, P. A. (1980). "Heckscher-Ohlin Trade Theory with a Continuum of Goods". The Quarterly Journal of Economics. 95 (2): 203–224. doi:10.2307/1885496. JSTOR 1885496. ^ Deardorff, A. V. (2005). "How Robust is Comparative Advantage?" (PDF). Review of International Economics. 13 (5): 1004–16. doi:10.1111/j.1467-9396.2005.00552.x. ^ Y. Shiozawa, A new construction of Ricardian trade theory / A many-country, many commodity case with intermediates goods and choice of production techniques, Evolutionary and Institutional Economics Review 3(2): 141–87, 2007. Y. Shiozawa, A Final Solution of the Ricardo Problem on International Values, Iwanami Shoten, 2014. ^ L. W. McKenzie Specialization and Efficiency in World Production, Review of Economic Studies 21(3): 165–80. Citation from p.179. ^ Chipman, John S. (1965). "A Survey of the Theory of International Trade: Part 1, The Classical Theory". Econometrica 33 (3): 477–519. Section 1.8, p. 509. ^ Deardorff examines 10 versions of definitions in two groups but could not give a general formula for the case with intermdiate goods. A. Deardorff, Ricardian Comparative Advantage with Intermediate Inputs, The North American Journal of Economics and Finance 16(1): 11–34, March 2005. See also http://fordschool.umich.edu/rsie/workingpapers/Papers501-525/r501.pdf See Appendix A: Previous Literature in particular. ^ Y. Shiozawa (2016) The revival of classical theory of values, in Nobuharu Yokokawa et als. (Eds.) The Rejuvenation of Political Economy, May 2016, Oxon and New York: Routledge. Chapter 8, pp. 151–72. Y. Shiozawa, The New Interpretation of Ricardo's Four Magic Numbers and the New Theory of International Values / A Comment on Faccarello's "Comparative advantage"). A paper read on a conference on March 23, 2016. ^ Chang, Ha-Joon (December 2003). "Kicking Away the Ladder: The "Real" History of Free Trade". FPIF Special Report. ^ Bernhofen, Daniel; Brown, John (2004). "A Direct Test of the Theory of Comparative Advantage: The Case of Japan". Journal of Political Economy. 112 (1): 48–67. doi:10.1086/379944. ^ Bernhofen, Daniel; Brown, John (2005). "An Empirical Assessment of the Comparative Advantage Gains from Trade: Evidence from Japan". American Economic Review. 95 (1): 208–225. doi:10.1257/0002828053828491. ^ Bernhofen, Daniel; John, Brown (2016). "Testing the General Validity of the Heckscher-Ohlin Theorem". American Economic Journal: Microeconomics. 8 (4): 54–90. doi:10.1257/mic.20130126. ^ Eaton, Jonathan; Kortum, Samuel (Spring 2012). "Putting Ricardo to Work†". Journal of Economic Perspectives. 26 (2): 65–90. doi:10.1257/jep.26.2.65. ^ MacDougall, G. D. A. (1951). "British and American exports: A study suggested by the theory of comparative costs. Part I.". The Economic Journal. 61 (244). pp. 697–724. ^ MacDougall, G. D. A. (1952). "British and American exports: A study suggested by the theory of comparative costs. Part II". The Economic Journal. 62 (247). pp. 487–521. ^ Stern, Robert M. (1962). "British and American productivity and comparative costs in international trade". Oxford Economic Papers. pp. 275–96. ^ Balassa, Bela. (1963). "An empirical demonstration of classical comparative cost theory". The Review of Economics and Statistics. pp. 231–238. ^ Dornbusch, R.; Fischer, S. & P. Samuelson (1977). "Comparative Advantage, Trade and Payments in a Ricardian Model with a Continuum of Goods". American Economic Review. 67. pp. 823–39. ^ Davis, D. (1995). "Intraindustry Trade: A Heckscher-Ohlin-Ricardo Approach". Journal of International Economics. 39. pp. 201–26. doi:10.1016/0022-1996(95)01383-3. ^ Golub, S.; C-T Hsieh (2000). "Classical Ricardian Theory of Comparative Advantage Revisited". Review of International Economics. 8 (2). pp. 221–34. ^ Nunn, N (2007). "Relationship-Specificity, Incomplete Contracts, and the Pattern of Trade". Quarterly Journal of Economics. 122 (2). pp. 569–600. ^ Zimring, A. & Etkes, H. (2014) "When Trade Stops: Lessons from the 2007–2010 Gaza Blockade". Journal of International Economics, forthcoming. ^ Markusen, J.R.; Melvin J.R., Kaempfer & W.M., K. Maskus (1994). International Trade: Theory and Evidence (PDF). McGraw-Hill. p. 218. ISBN 978-0070404472. Retrieved 2014-08-13. ^ Krugman, Paul R. (1987). "Is Free Trade Passe?". Journal of Economic Perspectives. 1 (2). pp. 131–44. ^ Irwin, Douglas. (1991). "Retrospectives: Challenges to Free Trade". Journal of Economic Perspectives. 5 (2). pp. 201–08. ^ Mankiw, N.G. (May 7, 2006). "Outsourcing Redux". Greg Mankiw's Blog: Random Observations for Students of Economics. ^ K.,, Galbraith, James (2008). The Predator State: How conservatives abandoned the free market and why liberals should too (First Free Press hardcover ed.). New York. p. 70. ISBN 9781416566830. OCLC 192109752. ^ a b c d e f g h i j k l m n o p Maurin, Max (2013). Les fondements non neoclassiques du protectionnisme (Thèse de doctorat thesis). 1995-2013, France: Université Montesquieu-Bordeaux IV. Bernhofen, Daniel M (2005). "Gottfried haberler's 1930 reformulation of comparative advantage in retrospect". Review of International Economics. 13 (5): 997–1000. doi:10.1111/j.1467-9396.2005.00550.x. Bernhofen, Daniel M.; Brown, John C. (2004). "A Direct Test of the Theory of Comparative Advantage: The Case of Japan". Journal of Political Economy. 112 (1): 48–67. CiteSeerX 10.1.1.194.9649. doi:10.1086/379944. Bernhofen, Daniel M.; Brown, John C. (2005). "An Empirical Assessment of the Comparative Advantage Gains from Trade: Evidence from Japan". American Economic Review. 95 (1): 208–25. doi:10.1257/0002828053828491. Bernhofen, Daniel M.; Brown, John C. (2016). "Testing the General Validity of the Heckscher-Ohlin Theorem". American Economic Journal: Microeconomics. 8 (4): 54–90. doi:10.1257/mic.20130126. Findlay, Ronald (1987). "Comparative Advantage". The New Palgrave: A Dictionary of Economics. 1: 514–17. Markusen, Melvin, Kaempfer and Maskus, "International Trade: Theory and Evidence"
Hardwick, Khan and Langmead (1990). An Introduction to Modern Economics 3rd ed. "Cloth for Wine? The Relevance of Ricardo’s Comparative Advantage in the 21st Century" VoxEU Ebook.